My first stop in the process was the The Smoking Meat Forums. If you haven’t registered I highly recommend it the site has a lot of information. I searched through this forum for solutions for each of the issues I had. Based on the research I tackled my problems in the following order. 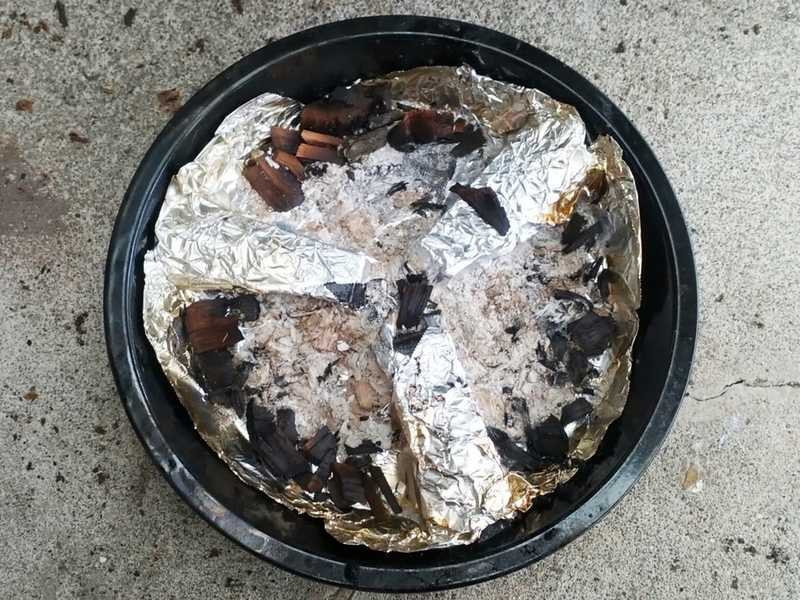 Most of the posts in the Smoking meats forum solved their issue with the chip pan by replacing it with a cast iron pan. I didn’t have one of those lying around and I didn’t want to spend 20-50 bucks on a new one just for wood chips. I ended up finding TT Ace’s post initial setup and using the Masterbuilt vertical propane smoker. I highly recommend this post for first time users of a Masterbuilt propane smoker. I took the pan suggestion from the forum and added foil to mine like the picture below. This solved my problem. The chips last 2-3 times longer now and I don’t see any temperature flair ups. This was an easy fix that I was able to implement before my first smoke. My thermometer on the smoker generally stopped at some point in the 200 °F. That coupled with the fact that you really need to know the temperature next to the meat made me look for a new thermometer. Again the Smoking meat forum pointed me to the answer. For smoking you need 2 thermometers one for the smoker and one for the meat. All the reviews pointed me to the Maverick ET732 Long Range Wireless Dual Probe Smoker Thermometer. So far this thermometer has worked really well. I have only used it for the smoker temperature right now. 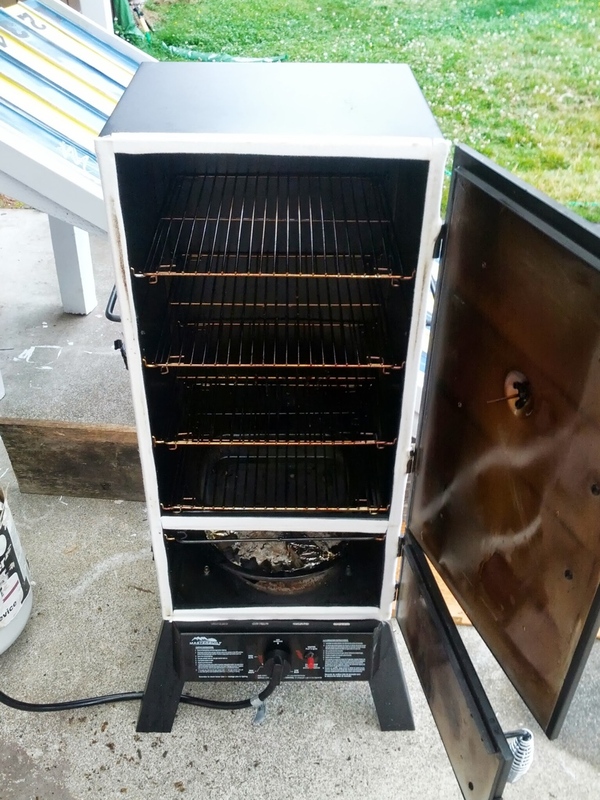 The first forum I came to in my research was on sealing your Masterbuilt smoker. Adding the steal sheets to each side of the smoker was too much work for me. 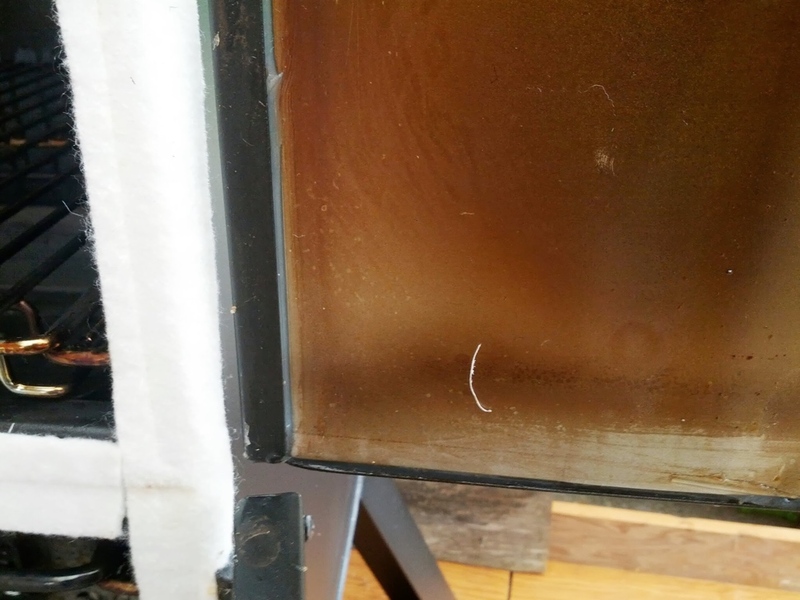 The forum did point me to sealing the gaps in the door and where the top and bottom connect to the sides. For sealant for the top and bottom I ended up with some RTV silicone from a local Ace hardware. I sealed the outside where the top and bottom connect to the left, right and back panels. I then sealed the inside of each door. The top door looked like below. The bottom door looked like this picture. I then let the sealant cure for 24 hours. In the mean time I had ordered the Nomex Masterbuilt smoker kit from BBQgaskets.com. I applied this after washing everything with vinegar and lemon juice. below is an image of the final product. One thing I would recommend is that you make sure that the gasket extra does not fold into the smoker. 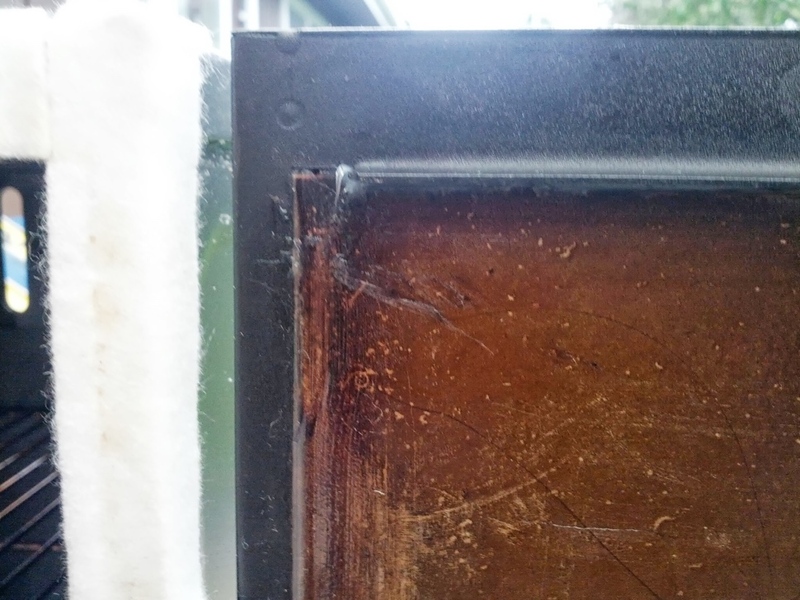 My very bottom gasket ended up getting burnt when I was firing the smoker to 400 °F. The gaskets still seal perfectly, but the bottom is burnt. Overall the changes have made a world of difference. I now know the correct temperature of the smoker. My wood chips last longer and smoke better. The temperature in the smoker is much easier to control.